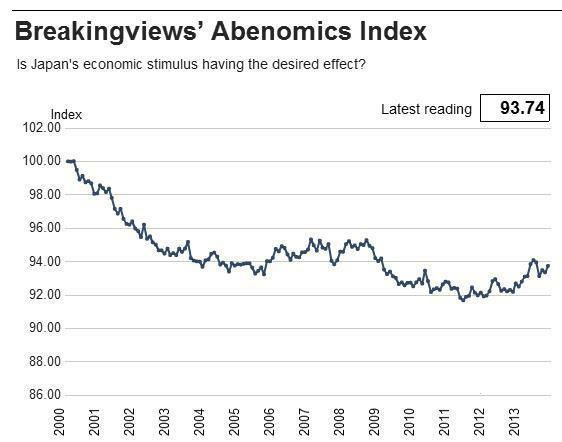 Breakingviews’ Abenomics Index rose the most in six months in September. The gain would have been higher but for Japan’s unusual current account deficit. Higher revised values for July and August suggest the risk of a significant slowdown in third-quarter GDP growth has ebbed. The Breakingviews Abenomics Index rose to 93.74 in September, a gain of 0.39 from the previous month, the fastest since March. Nine out of the 10 components of the overall index registered improvements. The only exception was the seasonally adjusted current account, which recorded its first deficit since February. The index values for July and August were revised higher to 93.49 and 93.35, from 93.45 and 93.32. Japan will report its first preliminary estimate of third-quarter GDP on Nov. 14. The economy grew an annualized 3.8 percent in the previous three months.